Previous edition: Sydney: Picador, 2005. SPECIAL 10TH ANNIVERSARY EDITION with exclusive extra behind-the-scenes material from the authorIt is 1939. In Nazi Germany, the country is holding its breath. Death has never been busier - and will become busier still. By her brother's graveside, Liesel's life is changed forever when she picks up a single object, abandoned in the snow. It is The Gravedigger's Handbook, and this is her first act of book thievery. So begins Liesel's love affair with books and words, and soon she is stealing from Nazi book-burnings, the mayor's wife's library . . . wherever there are books to be found. But these are dangerous times, and when Liesel's foster family hides a Jew in their basement, nothing will ever be the same again. 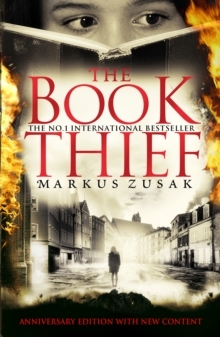 In superbly crafted writing that burns with intensity, award-winning author Markus Zusak has given us one of the most enduring stories of our time. Now a major film from Twentieth-Century Fox starring Geoffrey Rush and Emily Watson.